A couple months ago I wrote about an app that could be used to download songs from Grooveshark, but it was limited to songs you searched for one-by-one or songs that are on Grooveshark’s “Most Popular” list. The free SciLor’s Grooveshark Downloader can do all of that as well, but it also has a some other awesome features. What could make it that much better? 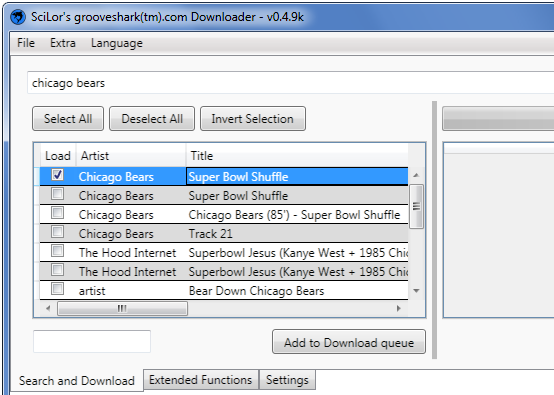 With this downloader you can login to your Grooveshark account and download songs that you have in your playlists. If you’ve already taken the time to organize your favorite songs into a bunch of playlists this makes it about as easy as it can get to download those songs on to your machine. It also has another interesting feature called “Batch Search & Add”. This will let you list out a bunch of search terms (one per line), and then the downloader will queue up the first result from each of the search terms. If you’re searching for obscure songs this may not work all that well, but for more popular tracks this can save a ton of time. Copyright © 2005-2017 CyberNet News. All Rights Reserved.